Sidhartha Group Presents their 3 project by the name of Estella (Sidhartha Estella). The project is located in sector 103, Gurgaon (Dwarka Expressway Gurgaon). Sidhartha Estella project has accommodation of 2/3/4 BHK apartments. In the project Estella Sidhartha have a joint venture of their 16 acres land with Ansal Buildwell (Ansals Estella). 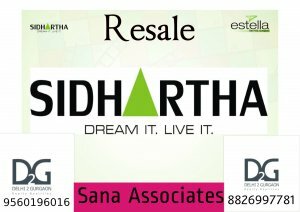 Sidhartha Ansals Estella project Gurgaon has total tower of 14 Nos. in which Sidhartha has 8 towers (Sidhartha Estella - Tower A - H) and Ansals Buildwell has 6 towers (Ansals Estella - Tower K - P). Sidhartha group after making an incredible mark in warehouses and land acquisition industry have coming up with the commercial and residential project in sector 103,113,110 & 82A, Gurgaon.